Technology is advancing rapidly, and one significant advancement in the field is Serverless Technology. But a complete list of monitoring tools is required to assist the developers in tracking about the actual ongoings and workflows on their applications. Serverless uses a unique monitoring system focused on the performance of functions and the robustness of workflows. One such tool in the arena is Dashbird. Dashbird is an observation and troubleshooting platform for serverless applications. 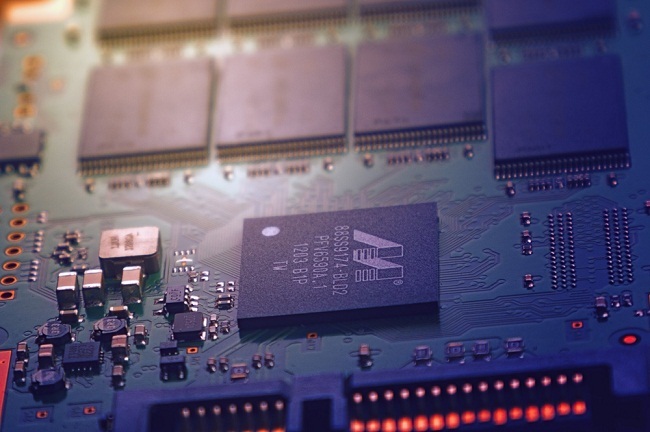 One major perk is that it helps in increasing development speed and helps optimize costs considerably with the help of accurate monitoring, tracing, error diagnosis and debugging features. The initial setup shall take only up to 2 minutes, and no code changes are required later. You are alerted of errors instantly via email or Slack, and thus, you can keep track of all your lambda functions conveniently. The co-founders of Dashbird, Taavi Rehemägi, and Mikk Kirstein believe in the most accurate and insightful monitoring approach with improved performance. The prime reason being that monitoring is more based on CloudWatch logs rather than newer codes running between the functions. As a byproduct, Dashbird found that their monitoring systems can be in use as a debugging tool to help developers collect feedback on the workflow of their serverless at the time of execution. As for now 95% of the market being on AWS Lambda, Rehemägi, CEO and co-founder of Dashbird said that they would look onto CloudWatch logs, along with being hooked to an AWS Service. The immediate effects being boosted the speed of setup and broader visibility. The traditional monitoring systems use a remote API to collect and send log data, later used to create dashboards. Unlike this, in the case of serverless, you have significant functions vanishing in split seconds, and timeouts are not generally recorded. There are three main types of errors that can be analyzed using Dashbird, which provides data on serverless performance, and integrates it with Slack to provides reports as and when required. Timeouts are currently the major types of errors in serverless workflows where a single function may take up to 6 seconds and more extended. According to Rehemägi, silent failures are a big issue because users rely on some functions which they think possibly won’t ever fail and hence, do not attach the error logs of the same. Going by reports, 10 to 20 out of 500 functions might show up errors which you possibly might not have even predicted. Configuration errors occur when a user forgets to attach a library, which in return doesn’t trigger the event handler and the problem doesn’t get recorded or reported. Looking up for something? Dashbird incorporates quick search across all your invocation logs. Dashbird alerts you over every code failures and helps in easy fixes along with providing error logs on Slack Community. Dashbird directly links with your AWS account to collect logs, integrating with X-Ray to offer the best serverless monitoring and debugging. 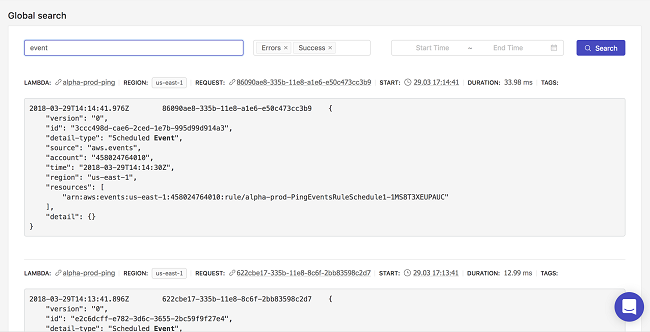 Using Dashbird, you can get a quick overview of the ongoings in the infrastructure of your serverless that includes several failures, latency, and overall health. Once you integrate your slack and email-id, you shall be notified about all the errors like early exits, timeouts, server crashes, cold starts, runtime errors and configuration errors. 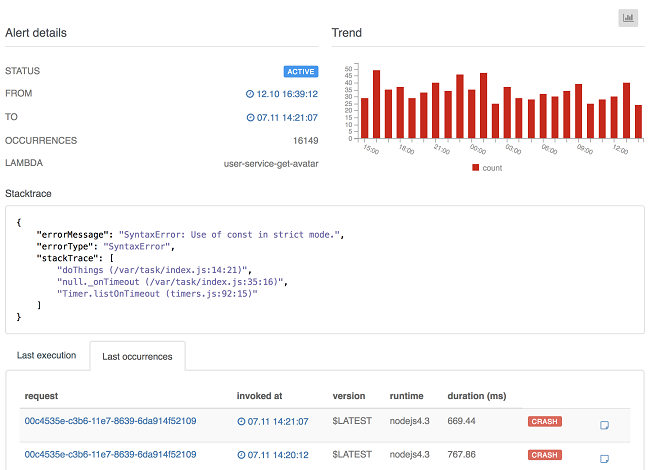 Easy debugging and troubleshooting: You can take advantage of Dashboard's easy error diagnostics, function statistics, advanced log searching, etc. 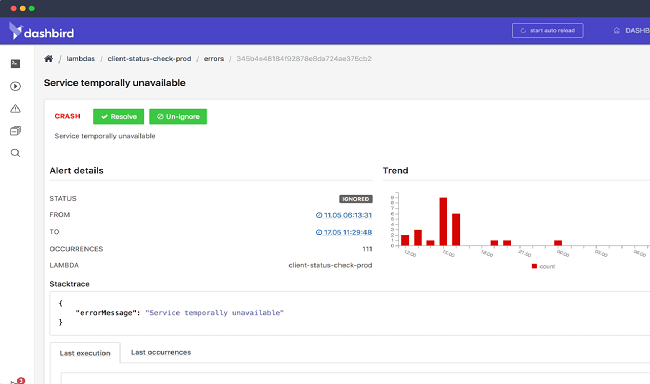 to diagnose and troubleshoot errors to deliver better serverless apps. 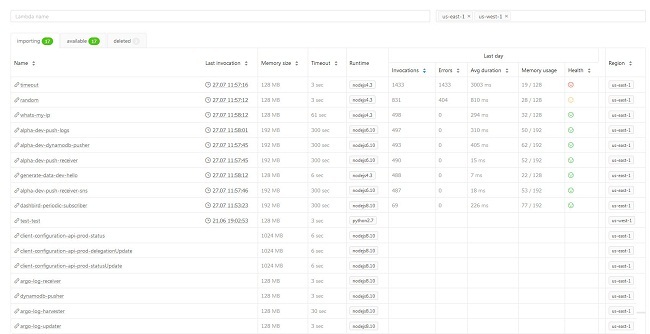 Full tracking over invocation flow: Using AWS X-Ray, you can collect data on duration metrics to analyze how long it takes to read and write data onto any service. The survey showed impressive business benefits the companies witnesses since they switched to serverless. On an average scale, there was about 77% increase in the speed of delivery; there was a save of 4 working days every month of the calendar and the monthly expenses going down by as much as 26%. The centralized view was excellent for tech lead and follow up of bugs. Also, there was an additional reduction in the costs and general lambda monitoring. The error reporting could be done correctly. Dashbird also gives a good overview of all the data logs and monitors them. The ease of use is a significant advantage. The app is entirely covered with metrics, logs, and general insights. Dashbird offers excellent customer support solving all your issues. A dedicated technical team is always improving the systems. Incredible real-time monitoring system useful in solving debugging issues with the app. More price range offers shall be useful. Real-time graph updates can be improved. Talking about Dashbird, there is almost nothing that comes to my mind as a deal breaker. The affordable costs starting at $24 add up to the positive reviews. Dashbird even has been supporting some new startups with super saver deals, which I admire! If you are planning to use its services for your company, I am pretty sure you would love the experience. I would say the app is fantastic in its entirety!